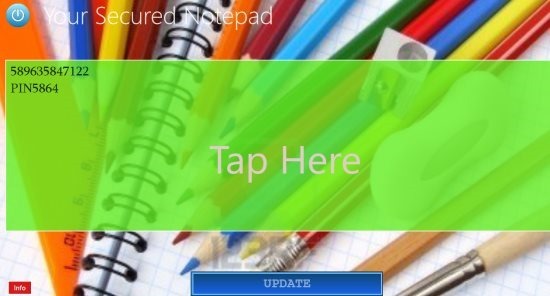 Lock Notepad is a free Windows 8 password protected notepad app that is protected by an Access Key and is available under the ‘Tools’ section of Windows 8 app store. This notepad Windows 8 app lets you create notes of all your important thoughts, ideas, tasks you need to accomplish throughout the day, and the like. This Lock Notepad Windows 8 app has been designed keeping your privacy in mind. It keeps you personal notes password protected and hence you need to enter the password before getting accessed with your notes. 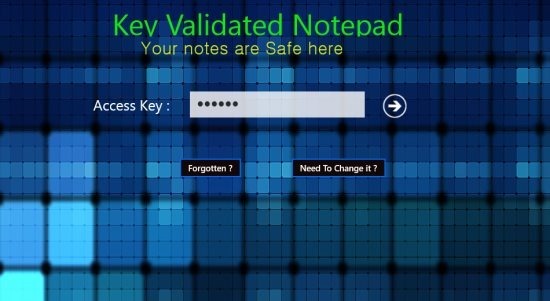 No matter, if it is your ATM PIN number, your account number, any password, or just a simple shopping list, you can keep all such things secure, only with this password protected notepad app for Windows 8. As you launch the app for the very first time, you will be asked to input a new password, confirm it and then, finally you can login to your personal Notepad. Just tap on the screen and start noting down all the important and confidential things you want to remember. You can also update the info. For this, just make the changes in your notes and click on ‘Update’ button. Now, you must be thinking how to logout from the notepad app. Well.. don’t worry, there is a logout button, given at the top left-side of the screen. Just click on it and confirm that you want to logout from the app. The interesting thing is that you can also change your password, in case it has been hacked or just because if you have forgotten your password. Let me quickly point out the features of this Windows 8 password protected notepad app below. Lets you create notes, write down your ideas, tasks you need to accomplish, etc.. keep all of them password protected. You can save your ATM PIN number, account number, important to-do list, or any confidential info. Lets you easily logout from the app. Lets you change the password anytime. Well.. I really liked Lock Notepad Windows 8 password protected notepad app. You can easily add notes and password protect it, change password anytime, update you notes, just everything you would expect from any advanced notepad app. Thumbs up to this one.. !! Also, check out our posts on Password Generator Apps, Password Manager Apps, and Time Management App. Click on ‘View in Windows Store’ to get the app opened in the app store. You can now proceed with further installation steps and download it, right away. In short, Lock Notepad is a good utility password protected Windows 8 notepad app to create notes and restricts others to access your personal notes. Go ahead and download Lock Notepad app in Windows 8 now.